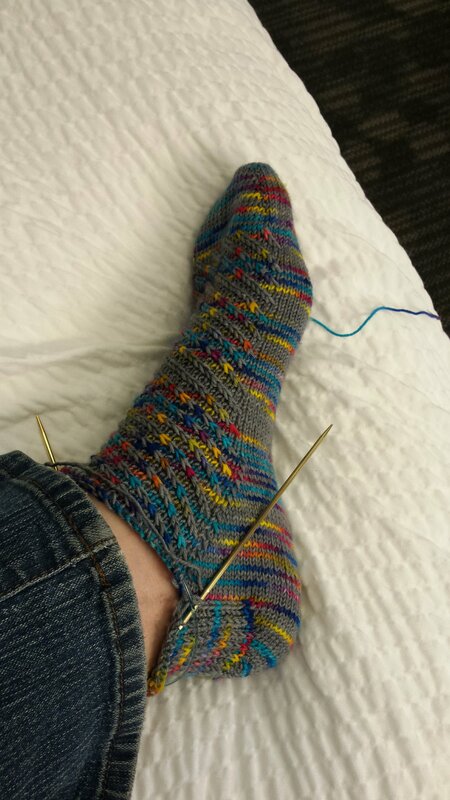 If you have followed me for a while, you know that I usually always have a pair of socks on the needles. Socks are a really great travel project for a number of reasons. 1. They’re small. They don’t take up much room in a carry-on, or in the car and they (typically) aren’t heavy. 2. They’re repetitive. Especially if you’re doing a plain stockinette sock, but even if you’re doing a simple pattern, it’s easily memorized and you can see what you need to do next by looking at the work you’ve done before. 3. They impress people. I get compliments every time. 4. They pass the time enjoyably and you get a pair of socks out of it! My latest pair have been going for a little while. I started them in March, and as usual, they’ve mostly lived in the car. 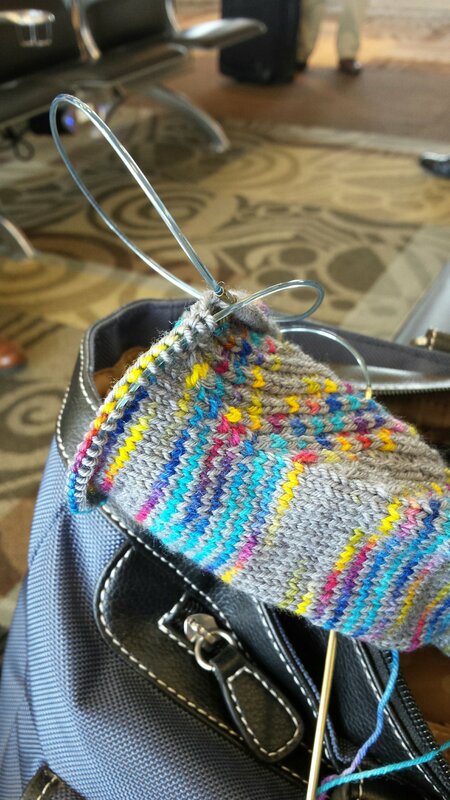 Even on short trips around town, a couple rounds helps get the whole project finished, so it was great when I got to the heels on both socks in time for my latest out-of-town flight. A couple of weeks ago, I went to Durham, North Carolina for a training class. The flight was short, just over an hour, but I always get to the airport in plenty of time to get through security, just in case there’s an issue. This leaves me sitting at the gate for a good amount of time, usually an hour or more. With the waiting time and the flight time, I had a chance to work on the heel of one of them. Increasing for the heel gusset in the airport. 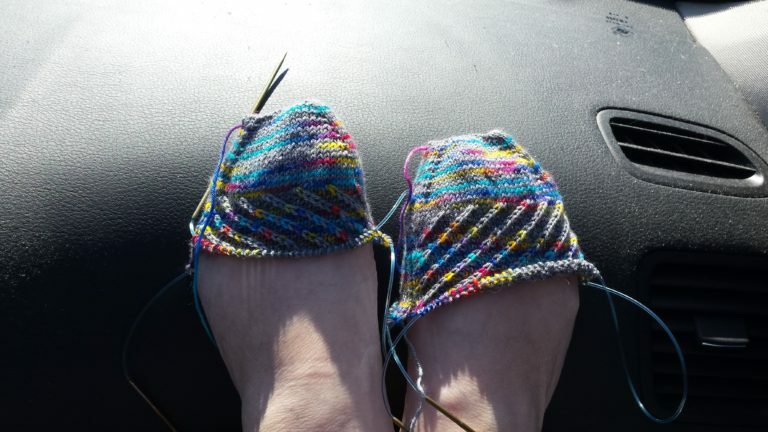 When we landed, I had just finished the first heel. I felt so great! 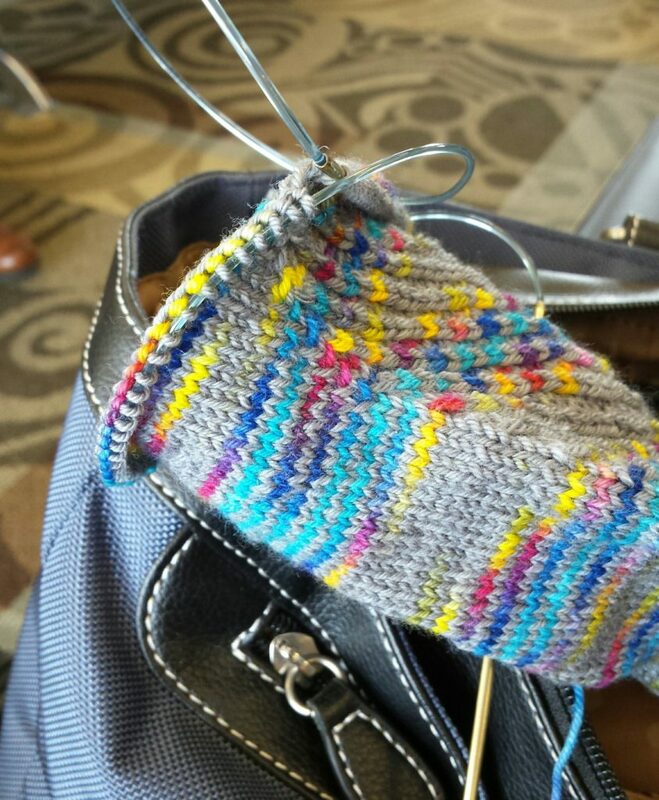 I made a heel, with all the distractions of the airport and the plane, and it looked great!! I was ready to get going on the other heel that night and get me some new socks! When I got to the hotel that evening, I tried on my new sock. Whoops. It was about an inch too long. It’s difficult to tell, but this sock is too big. The toe-end of the sock is about a half inch past MY toes. 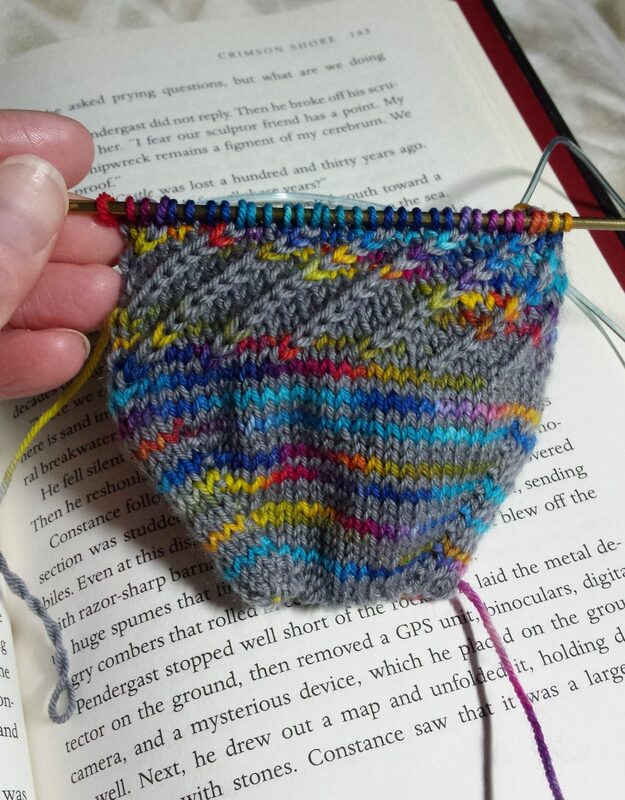 It’s sometimes difficult to tell where to start the heel when you’re doing toe-up socks. There are different techniques for making heels and they are all different lengths, so I’ve learned. The last heel technique I tried started at (what I think is) the navicular bone of the foot. (The little bony knot in front of and below your ankle.) 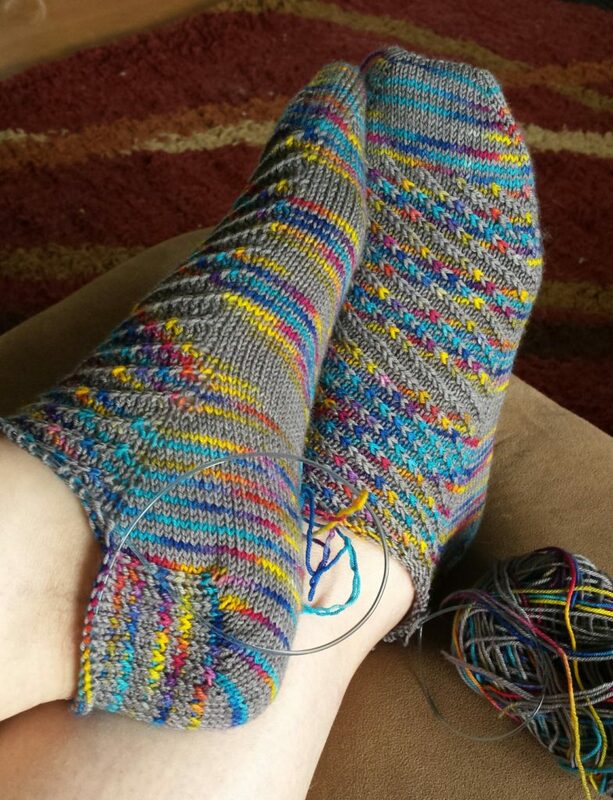 So, I knit the socks, trying them on occasionally, until they fit nicely up to that spot. 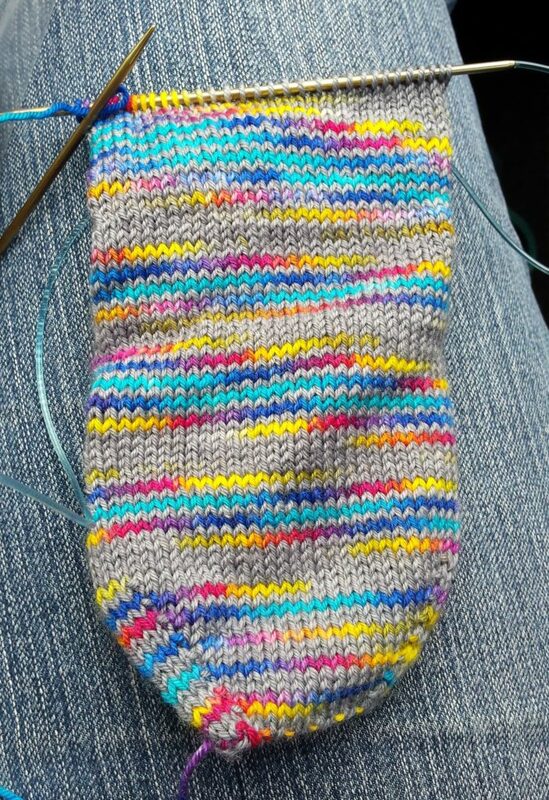 Then I started increasing for the heel gusset. I was tempted to just go on, finish the socks and give them to someone with a larger foot than mine. However, these are MY socks. And besides that, the only sock-worthy people in my life who have larger feet than mine are my husband, my brother and my dad. I don’t think any of them would wear socks in these colors. So, I ripped more than two hours worth of work out. Not only did I have to rip out the heel, but more than half an inch of the instep, too. 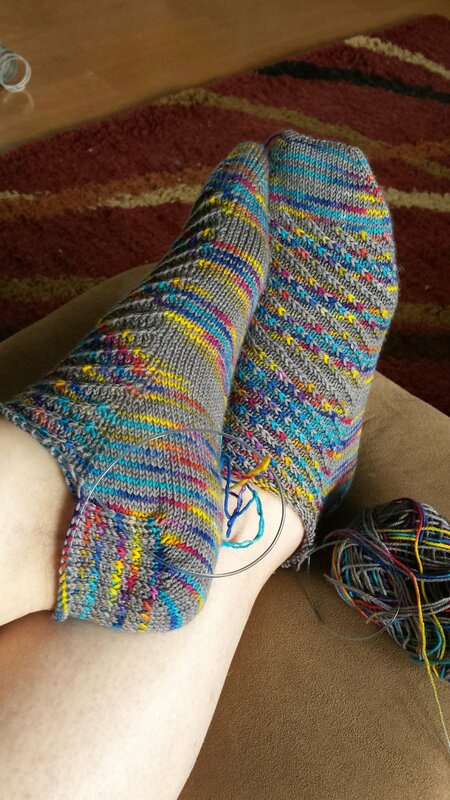 I felt a little defeated, but a) I want socks that fit me the right way, b) I would get more practice with this heel technique and c) it’s all just knitting, anyway. I knit one heel the next night and in the airport/flight time on the way home, I finished the other. Sock Heels that fit much better. 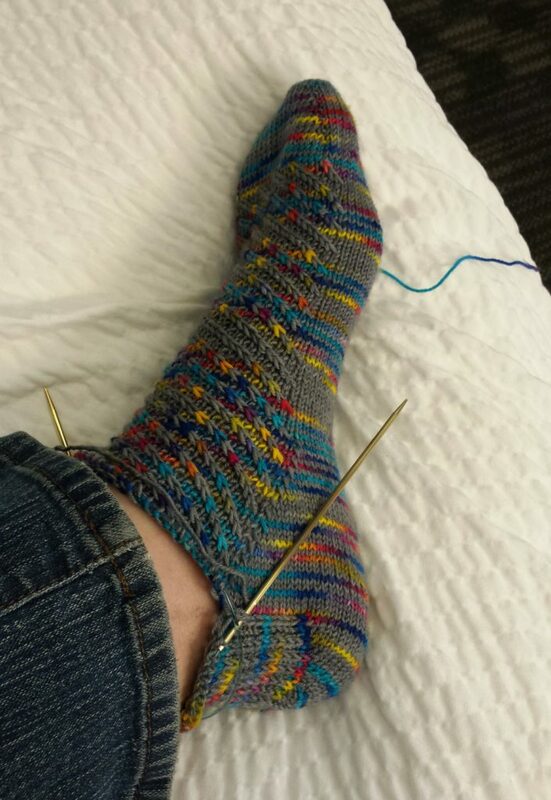 Now, I can continue knitting on up the leg of the sock. They’re still not quite right. I like my socks to fit tight, especially in the foot. These fit the width of my foot pretty well, but they are still just a little bit too long. Even though the yarn is superwash and won’t felt up to baby sock size, they will still shrink in the wash a tiny bit. I’m just not sure if they will shrink enough. So, these are sitting in time out for a little while while I decide whether to rip back a little further and get even more practice with the heels. If I did rip out, I would take it about a half inch shorter. Tight socks slip down and off the foot faster than looser socks, though, so if I make them too tight, they won’t stay on. I really want these socks to feel fabulous. It’s a tough decision. I think I’ll let it sit for a little while longer. I’m trying to enjoy more of the process these days, and not let the un-knitting bother me so much, but it’s hard. That’s why these socks are still sitting without a decision.